Note: This article is based on a keynote address delivered by H.E. 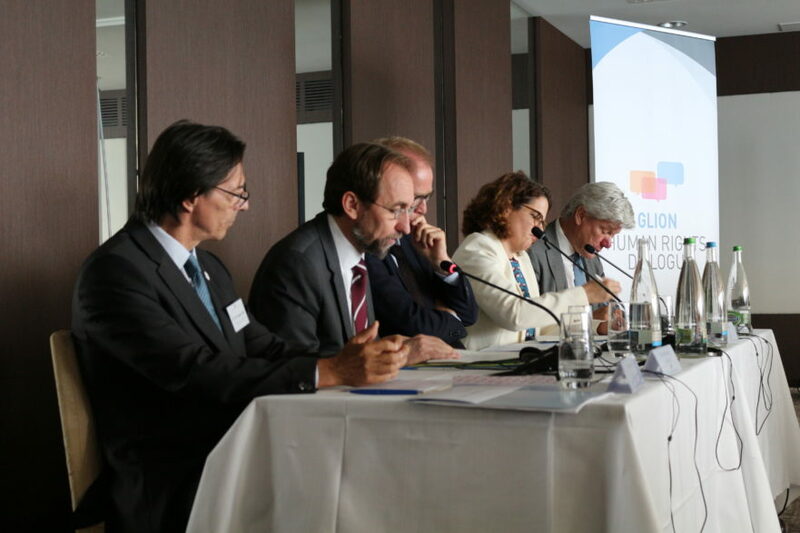 Mr. Zeid Ra’ad Al Hussein, High Commissioner for Human Rights, on Wednesday 30th June 2018, at the opening plenary of the fifth Glion Human Rights Dialogue, hosted by the Government of Switzerland and supported by the Universal Rights Group. First, let me make a few points about the Secretary General’s ongoing plans for reforming the UN. Their overall focus is prevention, with the understanding that reactive and fragmented approaches to violent conflict have been far too costly – in terms of human suffering and financial impact – and insufficiently effective. Prevention, like sustaining peace, is a human rights agenda. I have yet to come across a human rights measure that does not prevent or mitigate conflict: this is the essence of what we do. So this strong emphasis is a real opportunity for both the Council and the Office to become more central to the work of the UN. Many aspects of the Secretary General’s management reforms are extremely positive. They open the path to a simpler, more rapidly operational system, with considerable delegation to heads of entities across the Secretariat in terms of their administration and stewardship of resources. Having the authority to spend money as needed – and to report on results, on an annual basis – should mean the Office can avoid the current, frequently lengthy delays before decisions, including decisions by the Council, can be implemented. I am also hopeful that changes to the development system will open new spaces for human rights to be more powerfully mainstreamed into this key area. The reforms recognise very clearly that the UN development system needs to serve Agenda 2030, which is a manifesto for human rights: the Sustainable Development Goals are sustainable precisely because they are grounded in universal principles and norms. To deliver on this agenda, the Secretary General’s reforms propose a new generation of UN Country Teams, with more independent and more authoritative Resident Coordinators and a revitalized UNDAF planning system. It is critical to ensure that human rights norms, and human rights-based action, are firmly anchored in this planning. We need to ensure that the relevant expertise is present at country level, and that Guidance documents emphasize integration of human rights and the human rights mechanisms’ recommendations in country-team analysis, planning and advocacy. In recent years the Office has taken a number of steps to firmly anchor human rights in the work of UN development teams. These gains must be retained. Technical expertise on human rights needs to be systematized and ideally, Human Rights Advisors should be part of a standard package of support to Resident Coordinators and Country Teams. We have also produced the Universal Human Rights Index to give UN teams, States and civil society swift, comprehensive access to the recommendations of all the mechanisms – and I want to highlight here that the Index is searchable by SDG goal, so that recommendations relevant to each goal are immediately visible. In three of the workshops for Resident Coordinators which the Office has recently conducted, they were eager to take on this tool, particularly since these are mostly recommendations which States have accepted. A third significant measure is the letter which the Office now sends to each State and RC following the conclusion of their third-cycle UPR review, to indicate our thoughts regarding areas for priority action. The point of all this is to strengthen the implementation of recommendations and norms, because this is the delta point where we need to effect greater change. Looking forward, it seems to me the Human Rights Committee’s model of evaluating and grading States’ follow up of key recommendations could be an interesting example for other mechanisms, including the Universal Periodic Review. Another possibility could be using the general debate under item 6 in the Human Rights Council as an opportunity for States to report voluntarily on follow up action to their UPR reviews, one year after the adoption of their report and prior to mid-term updates. Moving on to the Secretary General’s peace and security reforms, it should be clear that the reconfiguration of headquarters architecture will need to carefully avoid diminishing in any way the place accorded to human rights. The UN has learned from bitter experience that human rights components are crucial for the protection of people from conflict, and that the work of human rights bodies are key for conflict prevention and sustaining peace. But Excellencies, there is an elephant in this room. I could make countless other points, including about the need to kick-start a new kind of communication about human rights, appealing to the public, particularly youth. The beauty of the Universal Declaration of Human Rights, and the reason for its unprecedentedly powerful appeal, is that it is not only true: it is presented in language that is real and alive. I could discuss – and we certainly will discuss later today – the upcoming General Assembly review of the Human Rights Council, and various suggestions for reform of the Council’s working methods. But there is an overarching threat I need to raise here. Worrisome trends in the Security Council, and the broader international community are making it harder and harder for human rights information to be heard. There is a growing divide between States about basic, universal human rights principles – even the whole idea that people have equal human rights. There are deepening divisions between States about the fundamental value of the multilateral system. Powerful Member States are pushing back very hard on human rights, undermining our Office on almost every issue that is raised within the UN. Nationally, as well as in international fora, there is a very forceful backlash against the progress which has been made on human rights in many essential areas. In April, the Secretary-General talked about the emergence of a new Cold War: “The Cold War is back — with a vengeance but with a difference. The mechanisms and the safeguards to manage the risks of escalation that existed in the past no longer seem to be present.” During the Cold War, this divide was between communism and capitalism. But now, it seems to me, there is a fundamental hostility being directed towards human rights and the rule of law, on the part of States which resent restrictions on their absolute freedom to exercise sovereignty, including massive oppression and violence. I know where that ideology has led the world in the past, and you do too. It is an existential threat to rights and a very real threat to humanity. So while it is essential to discuss reforms to our architecture in the coming years, I also want to leave you with this thought: let us not forget how very much this subject matters.